Sometimes I get California envy. Sometimes it’s about the weather, other times it’s about the citrus, but last week when this review of Three Trees Nutmilk popped up on Serious Drinks, it was about pistachio milk. It was a Veruca Salt situation and I NEEDED IT right away. Of course, it’s only available in the Bay Area, so I set out on a mission to make my own. I did break down and buy a nut milk bag from amazon a few months ago, but–real talk–I have not used it once to strain nut milk. I have, however, used it many, many times to strain boozy infusions. If you don’t have a nut milk bag, you could strain this through a double layer of cheesecloth if you prefer, but I found it didn’t really need it. 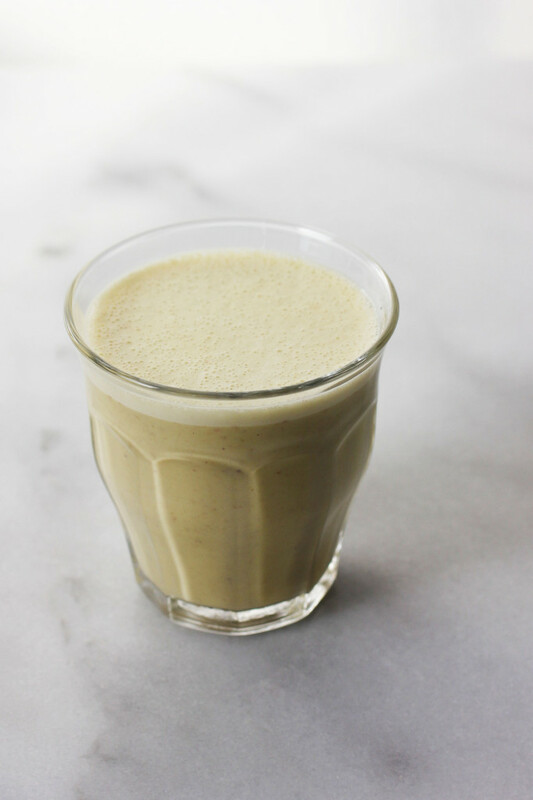 I followed my basic method for cashew milk as a base for this recipe and found that, like cashews, pistachios get soft enough after an overnight soak that the final product doesn’t require straining. If you’ve made homemade cashew milk before without straining, that is what you can expect from the final texture here. I have been drinking this straight as an after-work snack. So good! It manages to be both rich and incredibly light and fresh-tasting at the same time. Plus, the taste of pistachios really shines through in the final product. Although it’s great on its own, check back tomorrow for a pistachio milk recipe. 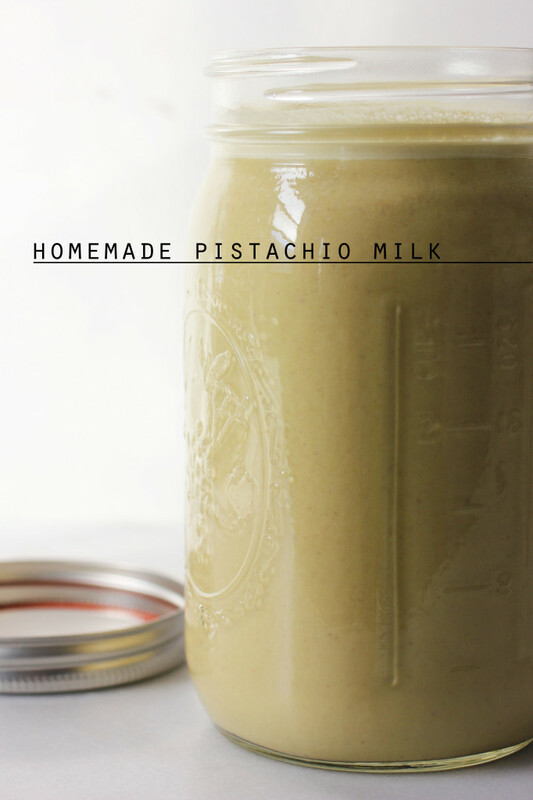 A DIY recipe for homemade pistachio milk that doesn’t need straining! In a bowl or jar in the fridge, soak the pistachios in water for 8 hours or overnight. Strain and rinse the pistachios, discarding the soaking water. Blend the pistachios with 1 cup water until a chunky puree forms. Add the additional cup of water and blend until smooth. Depending on your blender, this could take a few minutes. If you prefer, strain through a nut milk bag or double layer of cheesecloth at this point. Pour the mixture into a quart jar and stir in the final cup of water and the pinch of salt. My pistachios were roasted and unsalted. I imagine raw pistachios would produce an even more vibrant milk, but in my experience they’re quite a bit harder to track down. When I make homemade nut milks, I usually leave them unsweetened so if I use them in a recipe, I have more control over the sweetness level. Of course, you can add your preferred liquid sweetener to taste here. It’s normal for the milk to settle a bit as it sits in the fridge. Give this a good shake before you use it each time. Great! 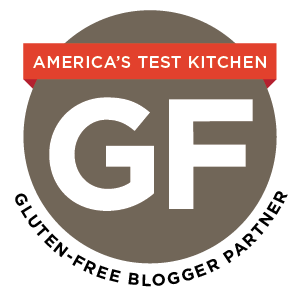 Another blog to obsess over… I LOVE this! So glad I stumbled upon your blog 🙂 Thanks for sharing this recipe. That’s so sweet, Ali. Thank you! This is so neat! I also get California envy, but it mostly has to do with avocados and wine. This looks amazing! I’ve been making almond milk for a while now, but this is probably to die for! Instead of using a nut milk bag to strain, I’ve been using flour sack towels. They work nicely and are dirt cheap. It definitely is a treat! Thank you. Pistachio milk?? OOH. I live in the SF bay area and everything, and yet I have never seen or tried this! Omg omg. This looks awesome. I always thought I needed a strainer, but now that I don’t, I can so see this happening! Hey 🙂 , I am made this milk and omg it was amazing ! So smooth and decadent ! Thank you . By any chance , how many calories per cup? Hi Michelle, I am not sure, but am happy to hear that you enjoyed it! Can you suggest ideas for the leftover pistachio stuff after the milk is strained? I’m off almost all carbs so no muffins or baked goods. Hi Autumn, I was wondering how many days can I store this in the fridge? Thanks for your help and for the recipe, it looks delicious and I am definitely gonna try this! 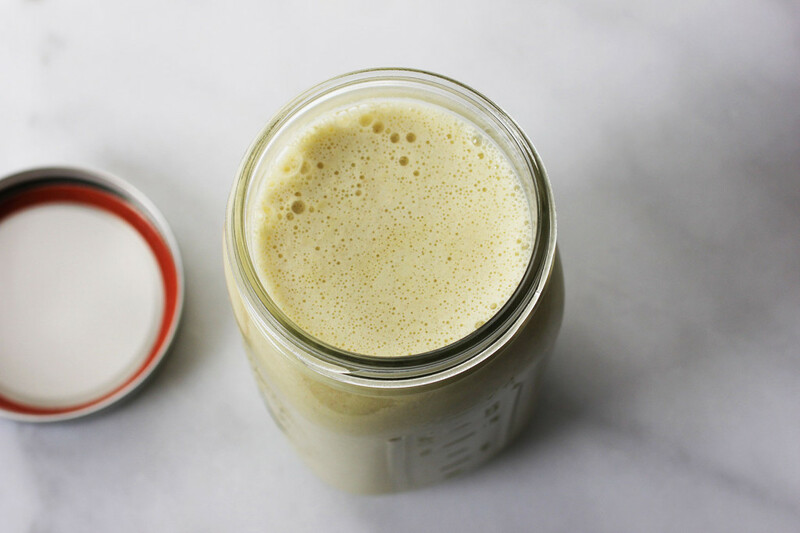 I typically try to use up my homemade nut milks within a week, but if it seems off before that, follow your instincts and toss it. Thank you! Hello! This post is a bit old, but I hope you’ll see this! Shelled nuts are nuts that have been removed from their shells, correct? So when I soak them overnight, they have already been removed from their shells…right? Sorry if that’s a super dumb question, I just want to make sure I understood correctly! This sounds amazing, love pistachio’s, I stumble across your site looking for Chia seed recipes as I’m about to embark on my first attempt. Thank you so much for sharing. I am going to try this out it sounds fabulous. Can I just ask the water you add when blending the soaked pistachios is it the water that they were soaked in or fresh water? 50 Recipes to Make in Your Blender - That Aren't Smoothies!